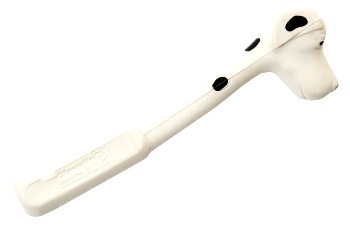 Dalmation reflex hammer is produced in non-toxic material, in proper anatomic format with a decorative figure of a Dalmation race dog, in two colors, used for medical use on children. It can have the client’s logo-brands engraved on the device. It is a product packed individually. It is used by doctors to test neurologic reflexes on children, has great acceptance and does not provoke fright to the little patients due to the animal figure appeal, which is widely common in the infantile universe.